I’m so happy Spring is here and I can turn my attention outdoors again. I’m ready to plant flowers and spruce up the backyard with art. I have a few outdoor craft projects up my sleeve that I can’t wait to share. This terra cotta pot wind chime is my first creation. It’s so bright and cheery and makes a lovely sound when the wind blows. Disclosure: Project materials and this post are sponsored by Plaid. Project idea and opinions are my own. Let’s get started. The first thing you’ll need is three terra cotta pots! I picked mine up at Walmart. You’ll need an extra small, small, and medium. Basically, three smalls pots that nestle inside one another. If your pots don’t already have holes in the bottom, you’ll need to drill your own. First, soak your pots in warm water overnight. The next day, remove the pots from the water and dry off any excess water. 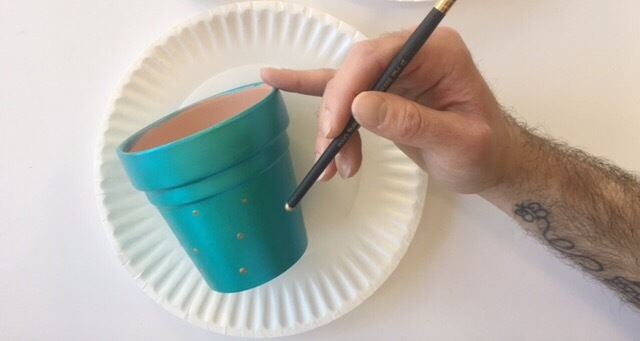 Place a piece of painters tape over the center of the pot where you intend to drill. Carefully, drill a hole through the tape into the center of the pot. I used a 5/32″ masonry drill bit. Ok, it’s time to paint! I chose to paint my pots with Folk Art Metallic Finish acrylic paint. I used Aquamarine, Inca Gold and Amethyst for my base colors and Folk Art Metallic Pure Gold paint as an accent. I painted them on using my Folk Art Artist Variety Brush Set. Be sure to cover the sides and bottom of the pot. I decorated all three pots with small dots in Pure Gold using the end of my paint brush. While at Walmart, I also grabbed some doll heads that I figured could be used as decorative beads on my wind chime if I drilled holes through them. I painted them Pure Gold, too. Once all my pots were painted and fully dried, I applied a few layers of Mod Podge Outdoor to seal them and help protect them from the elements. 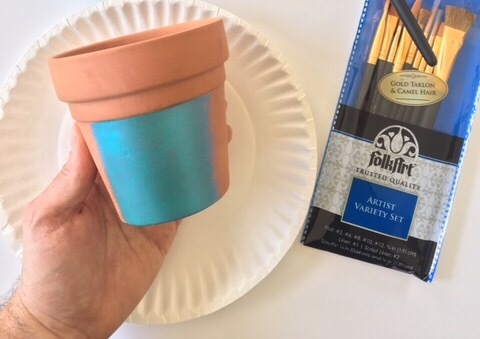 Brush on a thin layer of Mod Podge Outdoor onto all the pots. Wait 15 to 20 minutes and brush on another thin layer. Don’t worry it dries clear! Fun Fact: Mod Podge is 50 years old and today (May 19th) is National Mod Podge day! Woot! Woot! It’s time to assemble this baby! Walmart sells natural hemp twine that is perfect for stringing this project together. Run a long piece of twine through the hole of the largest pot. I added a bead onto the twine to catch the pot from sliding, but you could also just tie a large knot. Next, string on the middle sized pot. Tie a knot to prevent it from slipping. This pot should be slightly inside the largest pot, so they clank together when the wind blows. Repeat these steps for the final pot. String beads on the top and bottom portion of the twine. Make sure one is inside the smallest pot to create more lovely sounds. Hang outside and enjoy! Wait! The Mod Podge Outdoor has to cure for 72 hours! So, wait 72 hours, hang outside and enjoy! The sounds of these terra cotta pot wind chimes totally make it worth the wait. More outdoor projects are coming soon. Very, very cute and easy to do. Thanks for sharing!! Can’t wait to see more projects you’ve done. I love these and it looks easy enough for me. My only fear would be the wind blowing too hard & breaking the pots. Look forward to seeing other ideas. Thanks, Angie. Definitely would want to place in an area that maybe gets more of a gentle breeze and (if possible) bring in if there was a bad storm approaching. Always posting new ideas, stay tuned!